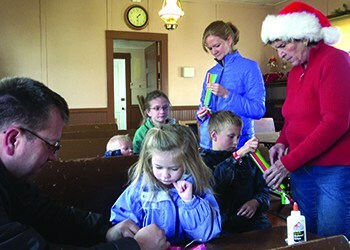 FOR RELEASE: ‘Tis the season to tour festively decorated historical homes and enjoy various activities during Homesteader’s Holiday at Centennial Village Museum, Saturday, Dec. 2, 10 a.m. to 4 p.m.
Visit with Santa, dip an old-fashioned candle, make holiday crafts, and see historical spinning and weaving demonstrations during the event. There will be food concessions available for purchase with proceeds benefiting the Friends of the Greeley Museums and Selma’s Store will be open. The store features unique gifts, including holiday items, and local and regional history books. There will also be musical entertainment inside the Weld Centennial Church that includes country guitar and vocals by Ray Delgado from 10:30 a.m. to 12:30 p.m., pump organ music and carol singing with Dorothy Elder from 1 to 1:45 p.m., and the Rusty 44 bluegrass band from 2 to 4 p.m.
For more information about Homesteader’s Holiday, visit GreeleyMuseums.com.